DECT wireless headset with 150m/490ft range, up to 13 hours’ battery life and integrated busylight. Can connect to 2 devices. Meets Skype for Business Open Office requirements. 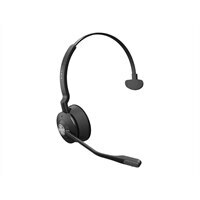 Jabra Engage 65 Mono Headset - on-ear - DECT - WirelessDECT wireless headset with 150m/490ft range, up to 13 hours’ battery life and integrated busylight. Can connect to 2 devices. Meets Skype for Business Open Office requirements.